This area is also home to the Watertown Farm and Craft Market which runs annually from May-October and is hosted by the local Chamber of Commerce in partnership with the City. The wide margins along this section of Washington Street allow for adequate growing space for trees and a shady place for folks to relax. 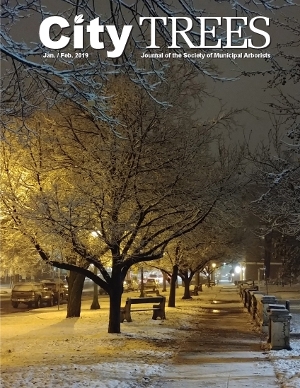 The Washington Street/Downtown Arboretum was developed by Tree Watertown, the City’s street tree advisory board, in 2003 as a way to show residents and visitors the unique variety of tree species that are located within the 200 Block of Washington Street. Over 30 different varieties and species of trees have been identified in this area. 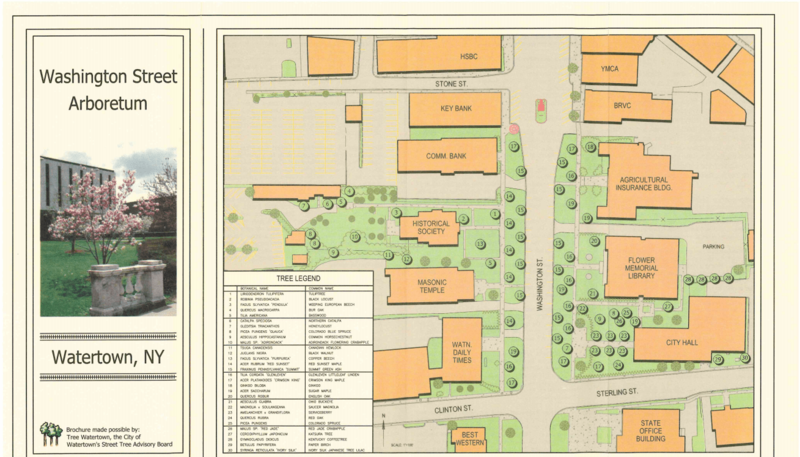 The original Tree Watertown Washington Street Arboretum brochure, from 2003. A tour brochure was created that included a map, detailing the location of numbered species listed by botanical name and common name in the tree legend. The numbers in the tree legend on the map correspond to the numbers in the species narrative on the back of the foldout brochure. The numbered species are also represented on the ground with informational plaques mounted on wooden stands at the base of trees. The rebranded Downtown Arboretum sign is ready for its unveiling this April. 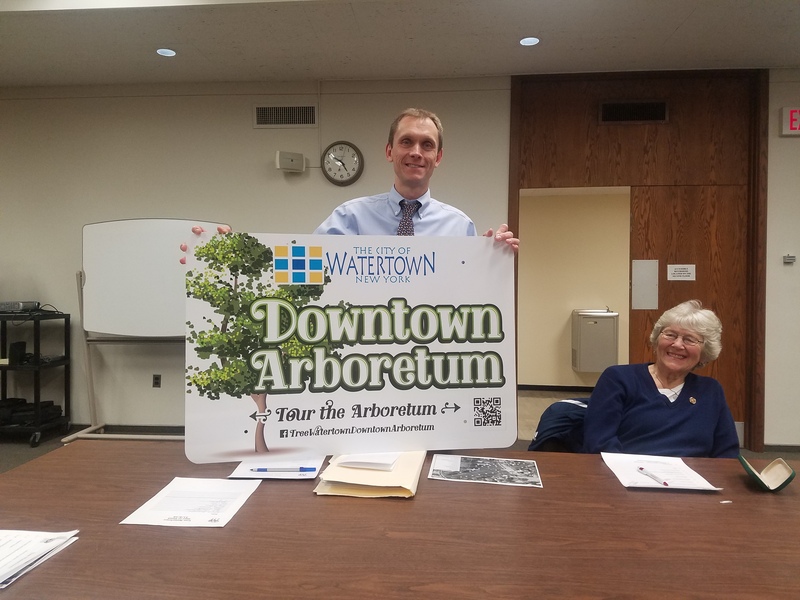 Proudly displaying the new sign are Mike Lumbis, a founding member of Tree Watertown & the City’s Director of Planning and Community Development, and Tree Watertown member Sylvia Buduson. Although still in the works, the Washington Street Arboretum will officially be renamed the Downtown Arboretum in 2019. In addition to being renamed, the arboretum will also get a modern facelift with the addition of a beautiful new sign (see photo above), an updated brochure, and an online story map. Using a smart phone or tablet, Arboretum visitors can scan the sign’s QR code and take a self-guided tour as they learn about the arboretum’s trees on a virtual platform. A sign-mounted brochure holder will provide a physical map for those that prefer a more traditional experience. The new sign is expected to be unveiled on Earth Day 2019 (April 22). 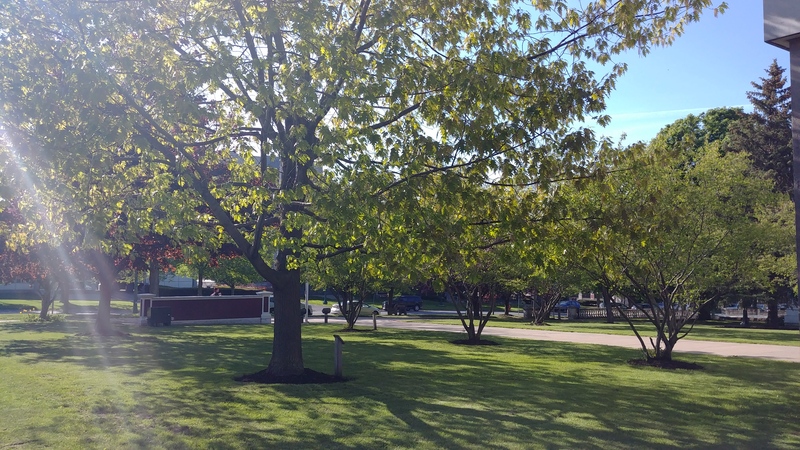 Red oak (Quercus rubra) specimen and serviceberry (Amelanchier x grandiflora) allée in the Downtown Arboretum. Throughout the tour, visitors will discover species like katsura tree (Cercidiphyllum japonicum) and bur oak (Quercus macrocarpa) as well as large-historic specimen trees such as ginkgo (Ginkgo biloba), tulip tree (Liriodendron tulipifera), black locust (Robinia pseudoacadia), copper beech (Fagus sylvatica ‘Purpurea’), and an interesting weeping European beech (F. sylvatica ‘Pendula’). We are also proud to have recently added a dawn redwood (Metasequoia glyptostroboides) to the collection. 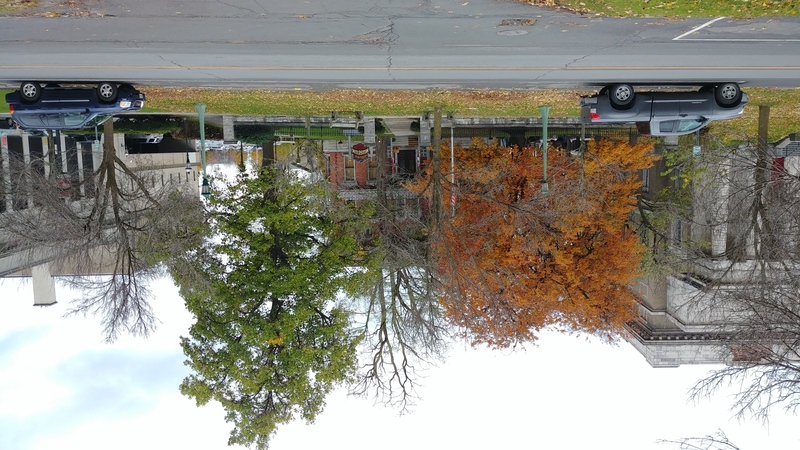 The iconic habits of a mature purple beech (Fagus sylvatica ‘Purpurea’, left) and tulip tree (Liriodendron tulipifera) can be seen in the Watertown Downtown Arboretum.